This document aims to support those working in Disaster Risk and Forecast-based Financing to utilise Household Economy Analysis in a way that can be beneficial to the development of DRF and FBF systems. Disaster Risk Financing (DRF) and Forecast-based Financing (FBF) are new forms of humanitarian action that move away from a solely reactive approach to crisis, and instead encourage the humanitarian and development sectors to take a more systematic and robust approach to managing and financing activities to address emerging risks. Household Economy Analysis is a unique methodological framework that determines whether households have the food and cash they need to survive and prosper. The guide can be used alongside existing HEA resources. It outlines how HEA can be used in the design of different components of Disaster Risk Financing. This includes using HEA as an impact model, in the contingency planning, and in the pre-positioning of financing and financial layering of risk. 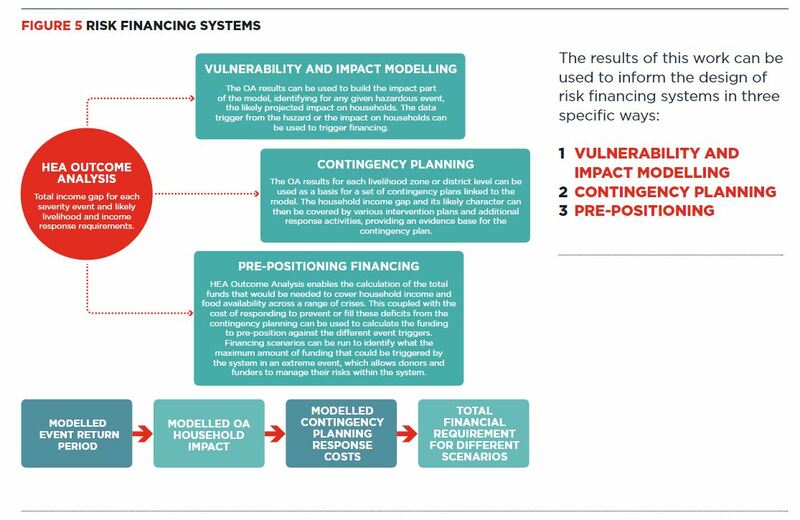 It is hoped that by providing the impact and quantitative link between the model, contingency planning and costing, the guide will create a clear line of sight between risk modelling and risk response actions, as well as common assessment of impact that can be corrected and improved throughout the system. Moreover, it is expected that by modelling likely scenarios, actions can be triggered before households face the impact of the shock within an FBF and anticipation window (or as soon as they feel it in more timely response), ultimately safeguarding food security and livelihoods from the worst effects of the shock (i.e. the loss of livelihood or extreme hunger). This guide is intended for people working in DRF and FBF, as well as those who have a working knowledge of HEA or have completed HEA Outcome Analysis training. More specifically, the audience for the guide includes IFRC and the Red Cross Climate Centre, the Start Network and member NGOs, UN agencies, governments, insurance and modelling companies, development banks and technical bodies such as the Centre for Global Disaster Protection.